Before you lose or forget your SmarterMail password, ensure that you have set up a backup email address. Your backup email address should be an alternate email account which you have access to and is where your reset password email message will be delivered should you ever lose or forget your password. 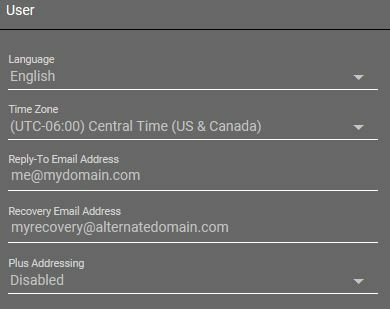 On the Account settings screen you will see the User box, where you may enter the address that you would like to use in the Recovery Email Address field (enter one of your alternative email addresses). Click Save at the top of the screen and log out of your account!